2014 is already shaping up to be a decent year for Mixmash Records. 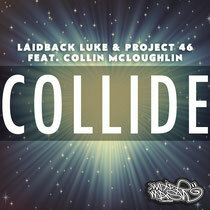 The first release for the label head honcho, Laidback Luke, comes in the form of a collaboration with Project 46 and Collin McLoughlin, entitled ‘Collide’. The official video premiered on Vice’s Thump recently, and features two young friends who attempt to build the perfect man for their beautiful neighbour. Laidback Luke’s fusion of hyper-drive-house-step and ghetto-jack-trance-bass blasts stir things up with his hybrid house styles and energy, resulting in top live sets and productions. Making an impact on the progressive house scene in 2013, Project 46's releases and hectic touring schedule earned the pair a place on DJ Mag's Top 100 DJs for the second year running, moving up 30 places. Their mixes of originals, remixes, bootlegs and mashups have drawn support across the globe. Collin McLoughlin is a singer and producer, living in New York. He's had a big 2013, achieving over 15 million hits on his YouTube Channel, and appearing on season 3 of “The Voice.” It’s out now, check it below.